On Dawaai 's website, you will be able to get all the information you need onthousands of medicines that have been researched, checked, and compiled by qualified pharmacists and doctors. 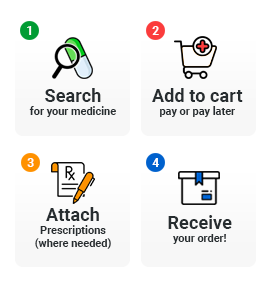 To provide you the utmost convenience in buying your medicines we provide you with the service of uploading your prescription by attaching it online and as you do that one of our experienced pharmacists gives you a call and guides you through the process of ordering. We don’t just sell medicines we provide you with Health and fitness supplements, vitamins, medical devices and disability aids, so you and your loved ones can lead a healthy lifestyle. Therefore our e-Pharmacy is an all-in-one healthcare platform that provides services for not just patients but for everyone who is concerned about their health and wellbeing. Some of our devices and equipments include; glucometers for Diabetic patients, blood pressure monitoring devices for hypertension patients and other equipment that improves geriatric patients quality of life. Wheelchairs, beds, crutches and other home care and hospital care equipments are also available on Dawaai.pk. Thanks to Dawaai never again will you have to blindly take medicines prescribed by your doctor, we will provide you with all the important information on those medicines, you will be able to know the uses, side effects, precautions and methods of taking the medicine. We have made buying medicines online as simple as possible. All you need to do is to log on to Dawaai.pk, search for the medicine, click on buy now, if it requires prescription - you can upload a copy of your prescription from your mobile, tablet or desktop and then check out. You can also send your prescription on WhatsApp or email us. If your order does not contain any product which requires prescriptions just proceed tocheck out and wait for our call. Shopping for yourself and your family's healthcare accessories has become easier than ever. Dawaai.pk is making all your healthcare needs accessible. For lab tests prescribed by your doctor, you do not need to travel to a laboratory and wait for hours to get tested. Our online medical store in Pakistan is providing you with the facility of getting your lab tests done from the top labs in the country, all from the comfort of your home. Simply visit our website and order the test you have been prescribed, you can also upload your laboratory test prescription and one of our healthcare professionals will call you to book a time. Our lab partners include Chughtai Lab, NIBD, Dr. Essa Lab, Excel lab, KLDC and many more are coming soon. This service is available across Pakistan. Lab test results will be delivered to you on your mobile, email and on your Dawaai health dashboard. When you are leaving one of our hospital partners after your discharge or doctor's appointment, we make it easier for you to buy medicines. Simply WhatsApp us a copy of your prescription or provide it to one of our staff members at our kiosk. We will get the medicines arranged from the hospital pharmacy, and have it delivered to you at your home. No need to queue up after a long wait at the clinic. Simply go home and rest. Our hospital partners include South City Hospital and Ziauddin Hospital. All medicines for their patients are dispensed from the respective pharmacies of these hospitals, and delivered by Dawaai. All these services are now available on our android and iOS mobile apps. You can buy medicines, view information on medicines and diseases, book lab tests, compare prices of medicines with similar generics, view your lab results, and use our health monitoring tools through the dawaai app. We strived to make healthcare convenient, affordable, accessible and transparent, and now we have made it mobile. You can pay using any convenient method. If you have a debit card or a credit card from one of our partner banks - Meezan Bank, Silk Bank, you can avail flat 15% discount on your medicines.